I love Thai food and especially everything with coconut and curry. I’ve made a vegan, gluten free curry with seasonable vegetables. Curries can be made with just about any vegetable or plant-based protein source (tofu, tempeh, seitan, pulses). It’s important to cut the vegetables in more or less the same size and to first add the ‘harder’ vegetables so they have more time to get tender. This is not a sattvic recipe as I’ve added some onion and garlic, but you can obviously leave that out. 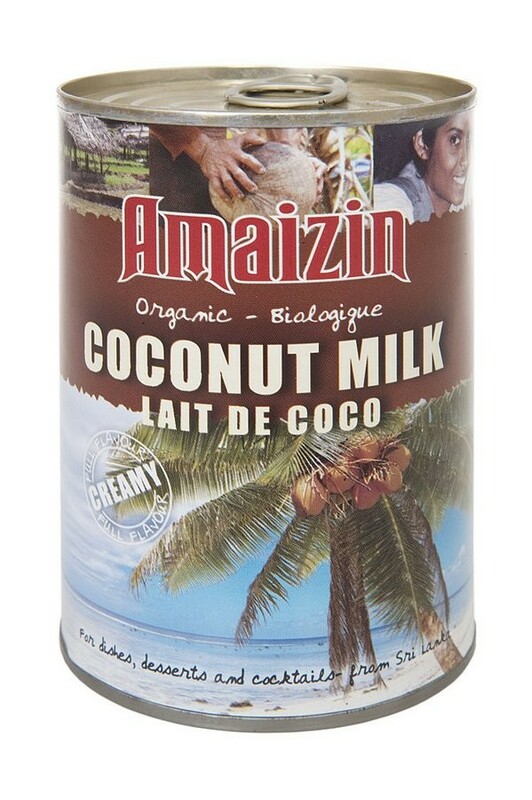 This recipe was inspired by the book Coco by Marie Laforet vegan cook, blogger, photographer and writer of cookbooks. Clean and wash the vegetables and cut in similar sized pieces. Boil water and poor over the broccoli florets and allow to soak for 5 minutes. Peal and slice the ginger in small bits. Cut the tempeh in 1 cm squares. Heat up the coconut oil in a frying pan (wok) and add the onion, stir fry for 2 minutes and add the ginger and the garlic , fry for 1 more minute before adding the tempeh. Fry for 3 minutes, or until the tempeh is golden. Add the red bell pepper, stir fry for 2 minutes. Add the broccoli, stir fry for 2 minutes. Add the zucchini, stir fry for 2 minutes. Add the turmeric, cumin and asafoetida and mix with the vegetables. 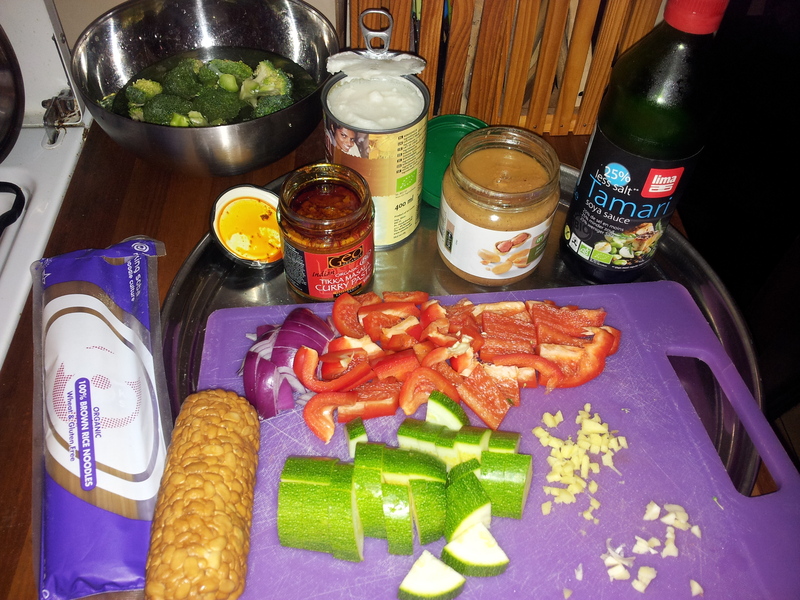 Add the tamari sauce, the curry paste and the peanut butter and allow the vegetables and tempeh to be coated with the mixture. Finally add the coconut milk, bring to boil and allow to simmer for about 10 minutes or until the broccoli is done but not too cooked. In the meantime bring enough water to boil for the soba noodles, add the noodles, bring to boil and lower to medium heat for about 5 minutes (see package instructions). Check the flavour of the sauce and season with salt, pepper and Cayenne to your taste. Once the noodles are done, rinse them under cold running water for a moment and directly serve with the curry sauce and garnish with some cashew nuts. 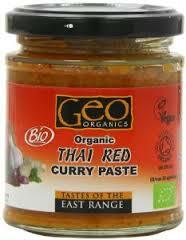 Categories: Yogi food | Tags: curry, gluten free, organic, tempeh, thai, vegan | Permalink. I adapted this recipe from a french recipe by Marie Laforet from her latest VEGAN cookbook that I absolutely love. Heat up the oven to about 180°C. Boil twice the amount of water as the amount of quinoa you are using (in this recipe: 1 cup). Rinse the quinoa & add it to the boiling water, let it simmer (don’t stir). Cut the tofu in small cubes, peel & cut the ginger in small pieces. Add enough tamari soy sauce in a deep bowl to coat the tofu, add the ginger, the sesame seeds and the tofu, mix it well and set aside, season with salt & pepper. Cut the zucchini in small cubes. Cut the bell peppers in half, remove seeds, wash and put in an baking dish. Heat up the coconut oil in a skillet, add the tofu and the remainder of the seasoning from the bowl and stir fry until slightly golden, add the zucchini, the parsley and Cayenne pepper and stir fry for a couple of minutes. Add the tofu mixture to the ready quinoa and mix well (of the heat source). Add the remainder of the quinoa/ tofu mixture in the baking dish around the bell peppers. Add the mixture in the bell peppers and put in the oven for about 30 minutes until the bell peppers have softened somewhat. Serve with a green salad with a light olive oil, mustard & lemon juice vinaigrette. Tip: depending on the season, you can replace the vegetables with other seasonal vegetables and you can replace the quinoa with another type of grain of your liking. Categories: Yogi food | Tags: gluten free, quinoa, recipe, tofu, vegan | Permalink.